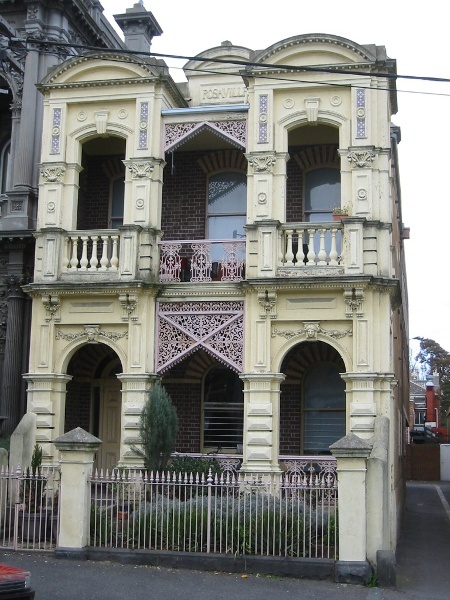 Rosaville, at 46 Drummond Street, Carlton, was built in 1883 for Abraham Harris to the design of the architect Nahum Barnet. Rosaville, an exotic example of so-called boom style classicism, is a symmetrical two storey terrace residence constructed of brick. 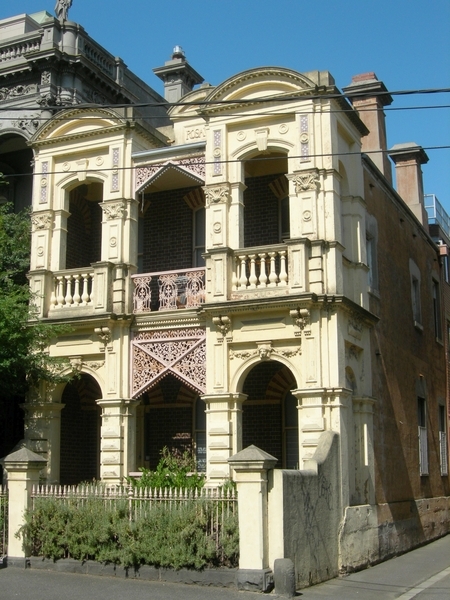 The elaborately stuccoed brick wings of the two storey verandah are divided by a cast iron balustrade panel and frieze. The stucco detailing is extremely Mannerist in style, expressed as a restless surface combining a range of classically derived elements such as pilasters, elaborate capitals, rustication, festoons, swags and dentillated segmental pediments. The openings on the two storeys as are treated as contrasting segmental and round arches. Additional decorative variety is given by the ornamental tile insets to the uppermost pilasters and by keystone faces. The parapet to the roof has a nameplate beneath a segmental arch pediment. An iron palisade fence between brick piers divides the small front garden from the street. Rosaville is of architectural significance to the State of Victoria. 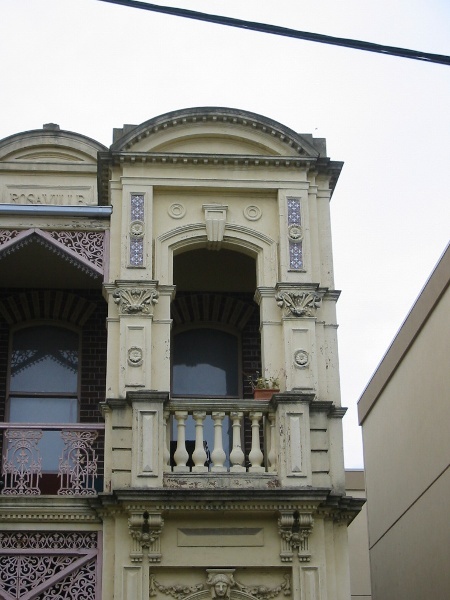 Rosaville is architecturally significant as an excellent example of so-called boom style classicism in 1880s Melbourne. 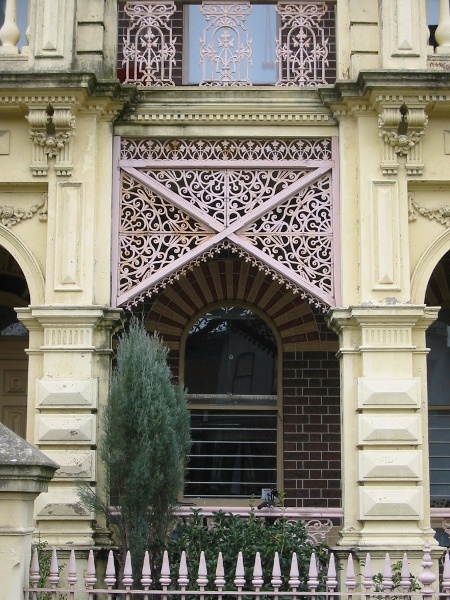 The highly ornate and mannered treatment of the verandah contrasts to the more conventional polychrome brickwork of the bulk of the house behind. Rosaville demonstrates the prevailing 1880s domestic architectural expression of wealth, opulence and confidence amongst the successful business classes. No. 408 Rosaville, 46 Drummond Street, Carlton. The property was rated for the first time in 1883. In 1884 it was described as an eight room brick house, with bathroom, scullery, balcony and verandah, tessellated pavement and woodhouse. Tenants included Frederick McCubbin in 1901-2. Rosaville was leased by the Royal Melbourne Nurses Home from 1909-1912. The State Government bought Rosaville and neighbouring Benvenuta in the late 1930s for 15,000 pounds. It presented both houses to the University of Melbourne in 1952 for use as student accomodation.